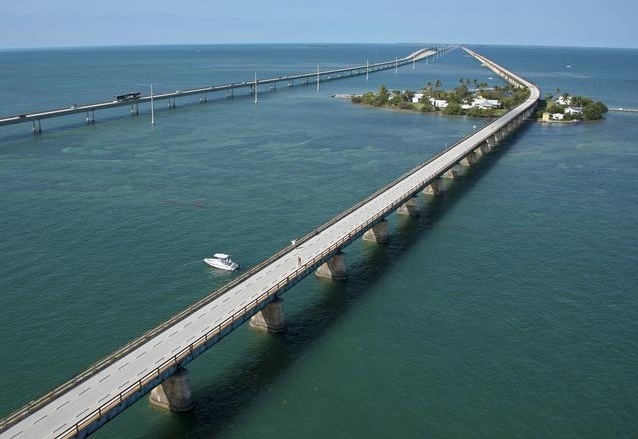 Grab your fishing rod, pack the cooler, and drive on down to the Florida Keys for a blissful day out on the historic old Seven Mile Bridge. While the adjacent bridge is used for automobile transportation, the old bridge is a lasting legacy of Henry Flagler’s Florida East Coast Railway. Flagler, co-founder of Standard Oil, first visited Florida in 1878. He quickly realized that the state’s economy could grow significantly with the addition of luxury hotels. In 1885, Flagler began development of the grand Hotel Ponce de Leon (now part of Flagler College) in St. Augustine. While the Hotel Ponce de Leon proved to be popular for winter snowbirds and generated a newfound interest in the state, Flagler believed that Florida needed a structured transportation system. 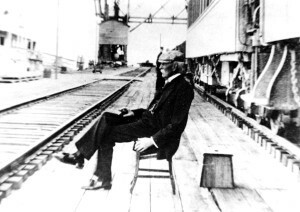 He purchased the Jacksonville, St. Augustine & Halifax Railroad, which had major issues including the interconnection between trains. This railroad served the northeastern part of the state and was the first railroad in Flagler’s Florida East Coast Railway system. By spring 1889 Flagler, who continued purchasing more railroads, had extended the rail service from Jacksonville to Daytona. In 1892 landowners south of Daytona wanted the rail service to extend another 80 miles. Flagler then stopped buying railroads and began laying out new tracks. By 1894, the railroad service reached what is now known as West Palm Beach. In Palm Beach, Flagler built his two iconic hotels, Hotel Royal Poinciana (later demolished in 1934) and The Breakers Hotel, initially known as The Palm Beach Inn and the completely rebuilt in 1926 after a fire. Also located in Palm Beach is Flagler’s grand winter home estate, Whitehall, now the Henry M. Flagler Museum. In September 1895, Flagler’s railroad system officially became the Florida East Coast Railway Company. In 1896 Flagler extended his railroad, with the help of Miami’s founder Julia Tuttle down to the Biscayne Bay area. 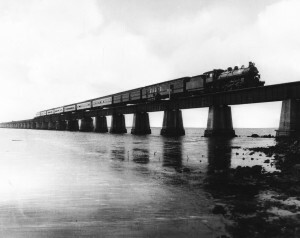 Flagler’s most ambitious project was the extension of his railroad system down to Key West. 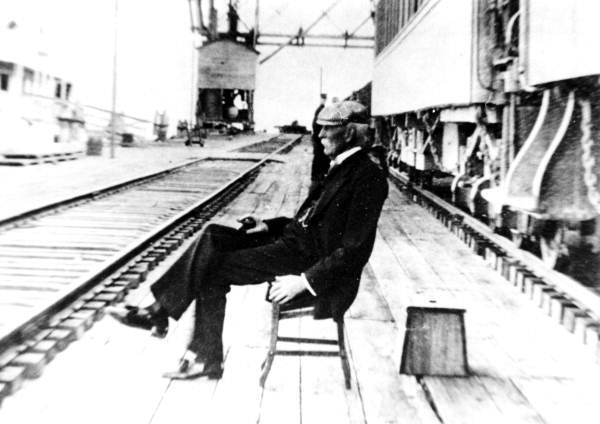 After seven years of construction, the Over-Sea Railroad opened in 1912 and was the closest United States port to the recently developed Panama Canal. The train depot also boosted Florida’s trade with Latin America. After the devastating 1935 Labor Day Hurricane destroyed the tracks, the railroad was converted for automobile use. 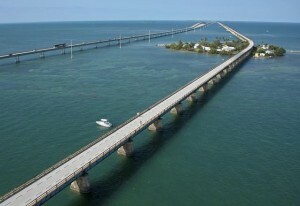 In 1982, the new Seven Mile Bridge opened to accommodate new automobile and sea traffic. These days the old Seven Mile Bridge is used as a fishing pier and as a scenic walkway for locals and visitors. Most recently, the 102-year-old bridge was granted a $77.5 million, 30-year-project plan to renovate and preserve a 2.2-mile stretch of the bridge. Also, check out the accompanying website to the exhibition The Great Days of Rail Travel on the Florida East Coast, which was shown at the Bienes Museum of the Modern Book, located at the Broward County Main Library in Fort Lauderdale, Florida, from October 1, 2013 through March 31, 2014. This entry was posted on Wednesday, April 23rd, 2014 at 2:36 pm and is filed under By Location, Key West, Preservation. You can follow any responses to this entry through the RSS 2.0 feed. Both comments and pings are currently closed.